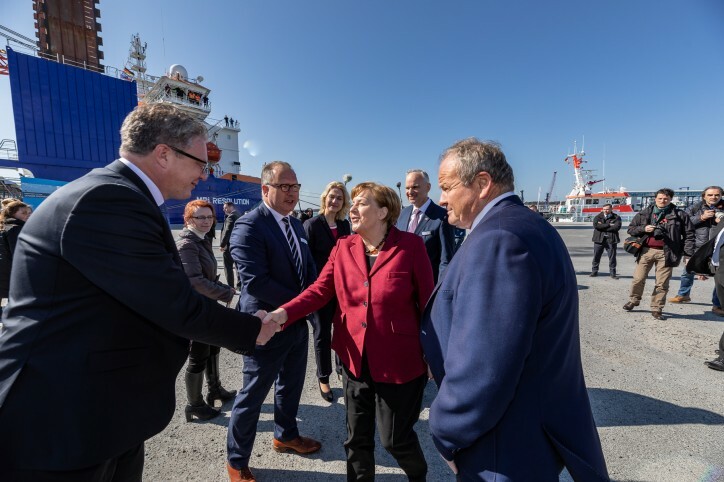 Yesterday, the Arkona offshore wind farm has been officially opened by German Chancellor Angela Merkel. ‘Arkona is an iconic project for future generations - built today!’ The opening ceremony was held in Sassnitz, Germany, on board one of Van Oord’s installation vessels. The 385 megawatts wind farm is located in the Baltic Sea, about 35 kilometres north of Rügen Island, Germany. The offshore wind farm provides 400,000 homes with sustainable energy and displaces approximately 1.2 million metric tons of carbon dioxide annually. This reduction fits the goals set by the German government to reduce CO2 emissions in 2020 with 40% compared to 1990.